Even then, that vineyard was known as one of the most beautiful and best in the area of Hochheim. Long before vines were grown on this hill, that idyllic spot was a preferred destination of the cathedral deans of Mainz. This is why that place was called "Dechantenruhe“ at the time of Victoria’s visit . In the same year Georg Papstmann requested the permission of the British Crown to call the vineyard, which had been visited by the Queen, the "Königin-Victoria-Berg“. 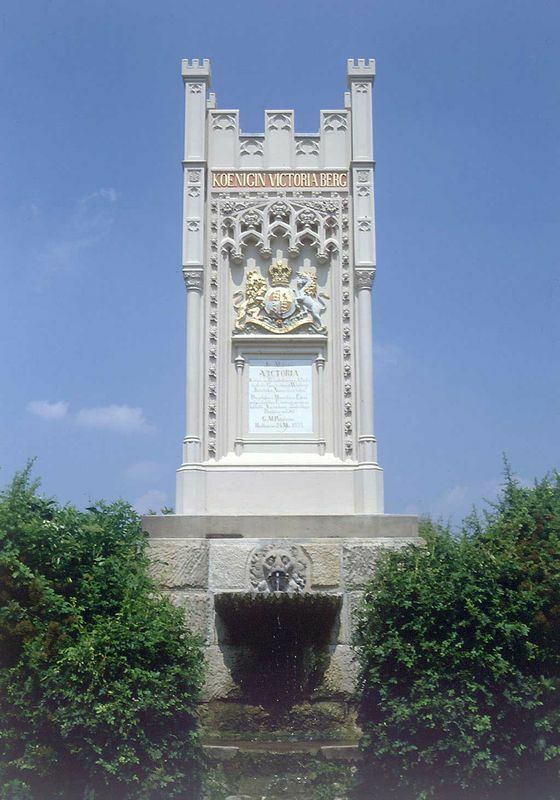 Since 1854 a neo-Gothic memorial commemorates the Queen and her visit. The natural spring, which flows here, was impounded and now rises from the open lion’s mouth. Above, an about seven meter high monument raises and widely overlooks the vine grapes across the plain. English-Gothic little towers as decorations take the observer back in the right time and atmosphere. Up to the present, a picturesque historicizing label has decorated each bottle of wine, originating from the Königin-Victoria-Berg. Until today, the wines have been served at visits of the British Royal Family. The vineyard estate Joachim Flick cultivates the vineyard site in a monopoly position and sells it to wine-lovers all over the world. Thanks to British Queen Victoria’s love for Hochheim vines the town is known around the whole Angle-Saxon world. Of course, hardly any Briton or American knows that “Hock“ is actually a malapropism of Hochheim. If a Briton speaks about Hock, he or she means wine from the Rhine river in general. Hochheim acted as a model for this linguistic development. Under the name of this wine and Sekt (sparkling wine) town German white wine made friends in all English-speaking countries. Therefore, the phrase "Good Hock keeps off the doc" goes back to Queen Victoria and her visit to Hochheim. The Queen-Victoria-Memorial can be explored and marveled at on a tour on the Wine Country Track Oberer Rheingau.